Arrival at Kathmandu Airport, meet & greet by our representative at a arrival gate, transfer you to hotel. Welcome drinks and check in room, rest of time visit to touristic area in Thamel, evening short briefing about your details program, meet with Guide. O/N Kathmandu. Early morning flight to Pokhara. Be sure to catch right side of the airplane for the best views of Himalayas. Pokhara offers magnificent views of Dhaulagiri, Manaslu, Machhapuchhare, five peaks of Annapurna and others. O/N Pokhara. After breakfast, we drive to Naya Pul and start the trek. From Birethanti, we trek uphill on the trail to Ghandruk. Enjoy the panoramic views of the mountains. Pass along various small villages such as Chimrong, Syauli Bazar, and Chane etc. Cross the suspension bridge over Khumnu Khola. Finally we arrive at Ghandruk, a slope settlement with stone houses mostly inhabited by the Gurung people. Along with enjoying the stunningly close-up towering views of Fishtail, Annaurna South, and Hiuchuli mountains, we also acquaint ourselves with the simple but rich cultural traditions of the Gurung people at the Gurung Museum in Ghandruk. O/N Tea House Guest Lodge. Climb up for an hour up to Ghandrukkot and then a steep descent takes us to the Kimron Khola. After another steep ascent from Kimron Khola, we make an hour of easy walk. Then we take a steep climb continuing up to Chhomrong. Towering above the village is the mighty peak of Annapurna South, with the Fishtail Mountain (Machhapuchhare) facing it across the valley. 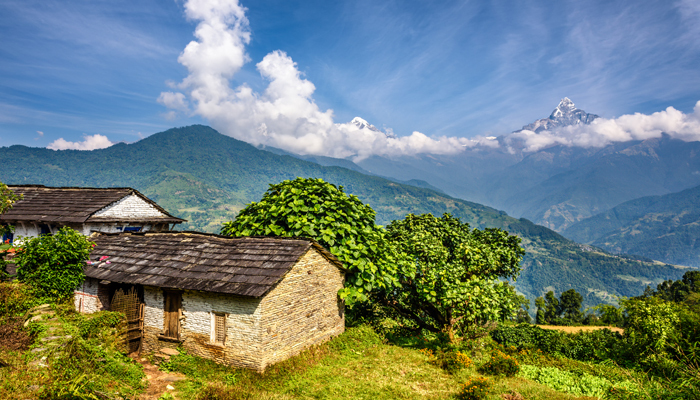 Chhomrong is a beautiful village located on the lap of giant Annapurna massive. O/N Tea House Guest Lodge. We head out of Chhomrong along the Modi Khola leaving behind inhabited foothills into the high step and wooded slopes of Himalayas. We cross the suspension bridge then trek up to Sinuwa Danda. The ascent from Sinuwa becomes somewhat flatter. The trail passes through thick and dark rhododendron forest up to Khuldighar. Then, we descend a long and steep stone steps into deep bamboo and rhododendron forests through which we reach Doban shortly. O/N Tea House Guest Lodge. The day starts with gentle gradual ascend following the trail above the river through a thick bamboo, oak and rhododendron forests up the side of the canyon. Pass by Himalaya Hotel. We cross two streams over small bridges. The trail passes through solitary places. Wilderness of the Mother Nature gives piece to our mind. There is also the possibility of seeing a variety of species of wildlife such as wild pig, deer, snow leopard, etc. Climb again to the Hinko Cave, an overhanging rock. Climbing further arrive at Deurali. O/N Tea House Guest Lodge. Today we start our trek to Machhapuchre Base Camp (MBC) at first a gentle climb through a river bed rises steeply over the mountain side. These are avalanche prone areas at some point on the trail, be alert to protect yourself if there is wind, this might be pre-avalanche sign. After about half an hour walk from Deurali, we will find ourselves in middle of river bed surrounded by giant snow-covered mountains. When the sun rises, the snow on mountains shine and river valley is filled with warm sun rays. We reach Bagar. The hike to MBC is somewhat strenuous but the unfolding views of the majestic Machhapuchre are certainly a rewarding experience. Enjoy the views of Mt. Hiunchuli, Annapurna South, Annapurna I, Annapurna III, Gangapurna, The Fishtail or Machhapuchhare. O/N Tea House Guest Lodge. On the way to ABC (Annapurna base Camp) from MBC, the vegetation disappears. We'll see the snow boulders melting and forming small streams. The path widens as we enter the sanctuary, follows a stream, and then climbs to a few huts alongside a moraine. There are sensational views of the near-vertical south face of Annapurna towering above the sanctuary. Annapurna Base Camp sanctuary boasts of a dynamic view without anything impeding panorama of the 360 degrees. Savor the mesmerizing views of the Machhapuchre, Annapurna south, Annapurna I, Hiuchuli and other peaks. Climax of our trip almost ends today. O/N Tea House Guest Lodge. Get up in the early morning and savor the magnificent sunrise over the Himalayas from ABC. After taking breakfast, we start descending from ABC to Bamboo back through MBC, Deurali, and Dovan and finally reach Bamboo. Heading back down to the valley is much easier than climbing up. You will see the waterfalls that drop down from a high point to the rocks below. We pass through the forests with great views of Fishtail and Hiunchuli mountains. O/N Tea House Guest Lodge. From Bamboo we make a steep ascent to the Kuldi Ghar and then to Sinuwa following the stone steps that leads to Lower Chhomrong. Then we ascend on the thousand stony steps taking us to Upper Chhomrong. From Chhomrong we descend to Jhinu Danda. We today get opportunity to enjoy hot springs lying just a 15-min walk from Jhinu Danda. Overnight in Jhinu Dada. Today, your adventure leads to beautiful village of Landrung village mix cultural and religious with lovely views of river as well as rice paddy agricultural seasonable vegetables still you have great views of Annapurna south and Himculi. O/N Tea House Guest Lodge. Early in the morning, you can enjoy the sunrise over the mountains in the vicinity of the hotel. We descend to Dhampush another beautiful Gurung village the last part of your hike takes you to Dhampush phedi about 1hrs, drive to hotel and rest of time leisure. O/N Pokhara. Left pane of the airplane would be best for views of Himalayas, upon arrival in Kathmandu; you will be transferred to your hotel, spend the day leisurely, perhaps catch up on some last minutes shopping or explore any sights you missed during your first day in Kathmandu and evening celebration dinner together. O/N Kathmandu. After Breakfast, Check out from hotel and proceed to Kathmandu Airport. Journey Ends here. INR 70,000 for Indian Tourist on twin sharing. INR 85,000 for Indian Tourist on single sharing. USD 1400 for Non-Indian on Twin sharing basis. USD 1600 for Non-Indian Tourist on Single sharing basis. Lunch + Dinner + Breakfast (Meals start with Lunch from day 01 and end with Breakfast on last day of trip) Only Veg meals will be provided. 02 nights at hotel on twin sharing basis in Kathmandu at Thamel area. 09 night at Tea House lodge on twin sharing basis during trek (At Tea House Lodge, toilet / washroom will be common) with one time hot shower facility charge during trek at Tea House Lodge. 02 English Speaking trained / government license holder trek Guide with 2 Assistance trek guide. Airfare for Kathmandu – Pokhara – Kathmandu include airport tax. National Park Permit and TIMS cards. 02 Walking pole stick to each trekker during trekking. Sleeping bag for trekking period only. Camera battery charge, telephone / calls during the trek. No any extra bed service for entire trip. Cost incidental to any change in the itinerary / stay on account of flight cancellation due to bad weather, Ill health,and roadblocks and / or any factor beyond control. Balance amount to be deposited 15 Days before trip departure. Any services initialized are nonrefundable and any expenses due to change in the program due to health or road blockage will be charged extra. If trek route is blocked or non-operational during time of trek, optional trek route will be provided.